Now I have a relatively small freezer, and it's full to capacity. And some of the things in there have been there for a long time. So long that they've become invisible to me. For the past couple of weeks I've been thinking about a winter project. One year I followed Lynda's lead and decided I was going to make at least one new recipe from every cookbook I owned. Since I owned over a hundred cookbooks at the time (and have even more now), I was pretty much doomed to failure, but I did manage to work my way through quite a few of them, and got some really great recipes out of it. So here's what I'm thinking for my winter project. By the end of March, I will have used up (or at least used) everything that's in my freezer at this moment. Don't you think that's a good project? 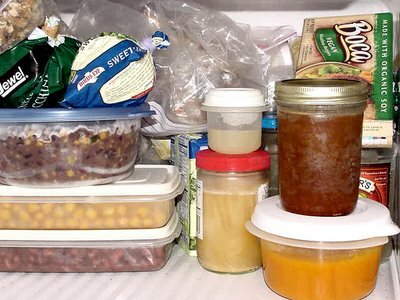 What's in your freezer? have you heard of this cookbook? Geoffrey Zakarian's Town/Country: 150 Recipes for Life Around the Table. takes that idea we were talking about as in what is in a persons pantry, makes meals around it. i have not seen it myself, but saw the chef on tv. I haven't heard of that book Nicole, but it does sound interesting. I'll have to take a look at it. It's funny you're talking about that, because I've been thinking about my all-too-brief "What's In Your Pantry" period and have been considering reviving it. I think it was part of the impulse that led me to examine what was in my freezer.